The breakthrough comes to us courtesy of the Total Mobility Project, a scheme intended to prepare for the rapid aging of Japan’s population and led by the local government of Fukushima Prefecture, which lies 300km north of Tokyo. Using a Mazda Roadster as a test bed [Subscription link], the team has succeeded in removing the engine and gas tank and replacing them with an electric motor and battery. 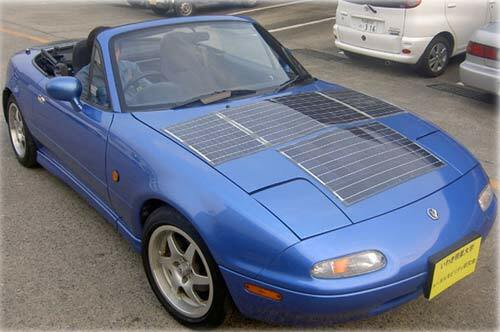 After slapping seven solar panels across the hood of the car, they found it able to run for 30km at a top speed of 100km/h. As for cost, the conversion ran to a hefty ¥2.5 million ($21,000), but the bright side is that drivers doing a daily average of 60km can expect to save ¥1 million ($8,400) over five years. Sponsored links: Unlock the key of your success for 312-50 dumps exams & 70-649 test by using our latest pmi certification and HP0-S27 prep resources and 640-822.